Dormitory in coorg with tariff, Hotel Maharaja, Kushalnagar, Coorg Dormitory Stay, Coorg Tourism, Coorg lowcost Hotels, Golden temple, Madikeri hotels. You can make your visit to Coorg a memorable and pleasant experience by availing our hospitality services to be enchanting experience of Coorg again and again. Our years of experience ensure excellent services delivering quality and understanding your requirements beyond the facility. The tourists of families, students and groups visited us during the past few years from all over the country has made us to think in terms of services without compromise in quality which cautioned us of resemblance. We hope you to experience the true hospitality and be cautious of similarity in name where our quality of services is not provided. Rs: 300/- per head per night. Hotel Maharaja, Coorg is located in Khushalnagar, BM Road, near Vijaya bank. Hotel Maharaja, Kushal Nagar Offers you ideal dormitories for the stay of large groups of people. And The three types of rooms have a tranquil ambience for a relaxing and soothing stay. The rooms- Dormitory ( 10, 12 Pax capacity Many Dormitories). Here can accommadate larger groups upto 180pax in different dormitories. Hotel Maharajas Standard Rooms are beautiful accommodation, ideal for 2 adults. 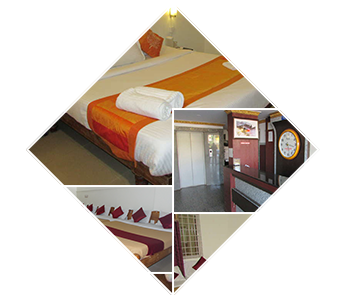 provide you a double bed, LED TV in the room, wardrobe and 24-hour room and laundry services. The room also has Wi-Fi access. air-conditioned and comes with a double bed, TV, wardrobe and 24-hour room. We also offer Wi-Fi access. Maharaja Palace Resort, Kushal Nagar, coorg. Resort offers travellers an enjoyable stay in Coorg. The resort offers luxurious accommodations at highly affordable rates, ensuring that our guests never want to leave! Perfect for families, married couples, or even a group of friends on a vacation, this resort has a multitude of facilities and services to offer its guests, making it a fantastic choice of stay. Its located Golden temple road , Kushal Nagar. Well maintained and spacious rooms are offered at the property, complete with essential amenities like room service, air-conditioning and Wi-Fi. Standard rooms, Deluxe rooms & Suite Rooms.